With our centralized management platform, services and SSL products we help you to tackle threats, minimize risks and manage SSL cost. What can our SSL Certificate Management tool do for you? Secure Sockets Layer (SSL) certificates are used to create a secure encrypted connection (e.g. between a client and a server and/or website). With the Redtrust product you can centralize, automate and have total control over all your SSL certificates. Do you know where your SSL certificates are installed? 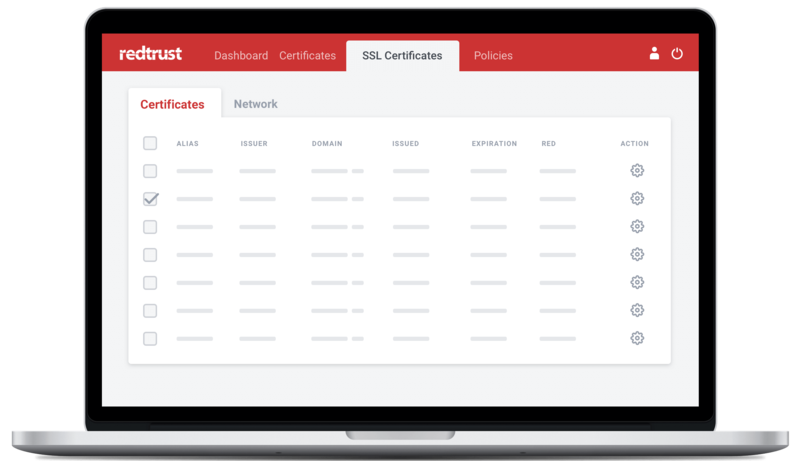 With the new Redtrust functionality, your SSL Certificates are now stored in a single secure HSM repository. Do you remember the expiration date of the certificate? With Redtrust, you can forget about expiration dates by configuring alerts. Define your enterprise’s servers and networks. Are you in control of the infrastructure affected by SSL services? Create custom networks where you can specify which SSL certificates affect them. Want to know more about managing SSL certificates? Use the market leading solution to overcome your hurdles to manage compliance and security with digital identity certificates. Allows the customer to extract information about their certificates automatically. Maintains information on the progress of the protection of a specific service: alias, chain of trust, domain, issue date, expiration date. Information on the security level of the inventoried certificates. Proactive control of the expiration of server certificates through the setting up of alerts.